The Differences between American English and British English. English, over the years, has become one of the most commonly spoken languages across the globe. It is the most widely spoken second language in the world. However, there are differences between the way in which Americans speak English and the way in which the British speak English. Most of the differences are very slight, the most noticeable difference possibly being the way in which some words are spelt. The reason for this is due to a man by the name of Noah Webster who lived in the late 1700’s. Webster was an author, teacher and politician, and wanted to move away from using British English as a way to show American independence from their previous colonial rule. He also wanted to change the spelling of many words so that words would be spelt the way in which they sounded. The IELTS organisers recognise the differences in the way in which individuals’ approach English, but they recommend that an individual be consistent in what type of English they use when tackling the IELTS Examination. So, if you are familiar with British English, than complete your entire paper using British English, or if you are more familiar with American English, be consistent throughout your paper using American English. Below are some of the differences you should be aware of when you approach your IELTS Examination. As stated above, Noah Webster embarked on a mission to change the way in which Americans spelt many words, so that words would be spelt the way they sounded. He became frustrated with the inconsistencies of spelling and pronunciation. He had great success in dropping the ‘u’ in many words. 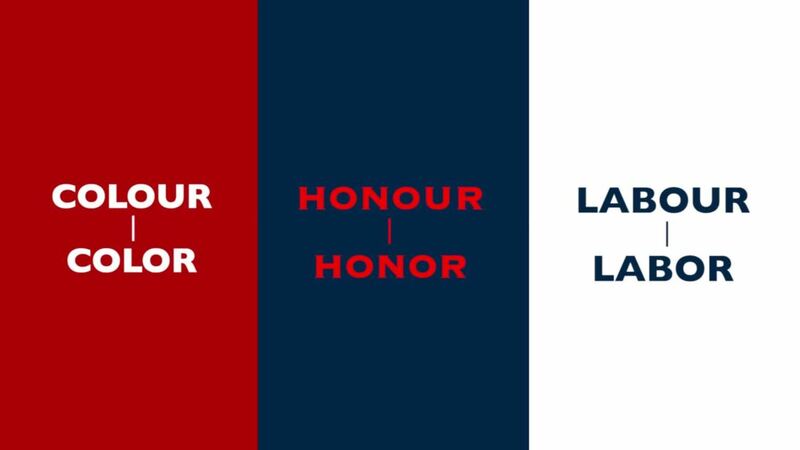 For example, “colour” became “color”, “honour” became “honor”, “labour” became “labor”. There are many other words where this applies, but to list them all will take much time. Other words also underwent a change, such as “organise” became “organize”, “recognise” became “recognize”. Many of us may not even notice these differences, especially if you type out your work, as this article is being typed, spellcheck is automatically changing the words to how they are spelt in American English. The British spelling rule of “re” in many words changed to “er”. For example, “theatre” became “theater” and “centre” became “center”. Whichever way you are most familiar and most comfortable with, either American spelling or British spelling, use that way during your IELTS Examination, especially the written examination, as the IELTS organisers are not concerned with which form of English you use, but are more concerned with how well you use the form of English you choose to use. There are many differences in vocabulary between American English and British English. However, if you are an American speaking to a British individual, you will probably understand each other due to the context given around many words. For example, Americans would say, “I live in an apartment around the corner from the drugstore where I get band aids.” Whereas a British person would say, “I live in a flat around the corner from the chemist where I get plasters.” And if you are a South African, you probably wouldn’t say “drugstore” or “chemist”, you would possibly say “pharmacy”. When it comes to vocabulary when writing the IELTS Examinations, as well as the speaking examination, the best is to stick with what you know and are most comfortable with. During the listening examination, you will listen to people speaking from various parts of the world, like India or Australia, and in all of these countries the vocabulary is different, but as stated before, we can often understand each other by the context of what we are talking about. So don’t be concerned if you come across a text or a listening piece where a person may say,” When I go on vacation I must not forget my sneakers and my sweater.” You will know that the person is going on holiday and mustn’t forget their jersey or jumper and their takkies or trainers. Vocabulary always differs from one place to the next, just remember to always listen to the context as this will guide you to a person’s meaning. When it comes to grammar, there are differences, but American culture has influenced British culture through music and movies, and vice versus, that the differences are not as pronounced or noticeable as they once were. For example, when it comes to prepositions, Americans would generally say,” I am going to the beach at the weekend”. Whereas the British would generally say,” I am going to the beach on the weekend”. Another grammatical difference would be that a British person would not say the word “gotten”, they would say “got”. For example the Americans would say,” I haven’t gotten any news from the doctor.” Whereas the British would say,” I have not got any news from the doctor.” Americans have also made a grammatical change with the use of regular and irregular verbs. These are often not noticeable when speaking to one another, but in written form, these changes are noticeable. Many irregular verbs used in British English such as; dreamt, leapt and burnt, have been changed to regular verbs in American English and are now; dreamed, leaped and burned. The Americans have favoured using “ed” rather than “t”. When it comes to grammar, you need to be consistent with the type of grammar you use, be it American or British, when you tackle the IELTS Examination, especially the written examination. You have possibly been taught and trained in English from a very young age, and so the best advice would be to trust yourself, and trust what you have been taught. The IELTS Examiners are going to want to know how well you can command the English you speak and write, not how well the person on the other side of the world can command the English they speak. When they are examining you, they are not concerned with anyone else, so bring the best of yourself forward as you conduct the form of English you use across all the four types of IELTS Examinations. There are many other subtle differences between the American and British use of the English language, and you could look them up and study up more, however, these are the main differences that could possibly affect you during the IELTS Examination. If you have been taught English from a young age or have learnt English through television and music, you have possibly adopted you own style of speaking English without consciously realising you were leaning more towards American or British English. Another factor to take into consideration would be your own cultures influence over the English spoken in your area. Many people would adopt the slang or common colloquialisms spoken in the area in which they live and not what is spoken in another part of the world. The IELTS Examination would take all of this into consideration when marking you. They do have an exceptionally high standard and it is encouraged for you to get some training before you sit down to your IELTS Examination so that you know you are able to perform to the best of your abilities. However, consistency in how you approach your Examination is crucial, so you are encouraged to stay consistent to the form of English you start your Examination using, be it American or British.